Getting A Visa - How Do You Get One? The steps you need to follow will depend on whether you need to get the visa before you leave home or if you can get it at the airport on your arrival. We're going to deal with tips for U.S. citizens getting visas to other counties. ...and from what we've heard... a little frustrating. Citizens from countries in the visa waiver program should have no problem visiting the U.S. But we're not going to deal with that here... This is for US citizens traveling abroad. Sometimes you will be getting a visa when you enter a country... We did that in Cambodia a few years ago. You'll have passport size photos and fees available as needed, and after you get through the bureaucratic line, you're on your way. This is what happens more often... Some counties require that you get a visa before you leave on your trip. This usually means that you need to get some sort of an official stamp or page glued into your passport. You can use your travel agent or a visa service. Some travel agents can help you get necessary visas. Or, you can even hire a service to get visas for you for an additional fee. We've always gotten our own visas. There are a few countries that are beginning to issue visas electronically. Australia, for instance, now grants them electronically for eligible citizens of many countries. When we went on the Trans-Siberian railroad, we had to send paperwork in electronically, then visit the consulate to turn it in physically. 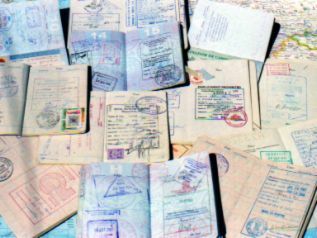 Most countries still require you to fill out paperwork and submit it to the appropriate government agency before you leave on your trip. You can generally download a visa application from the internet. Go to a website for the Embassy or a Consulate of the country you want to visit. If you need a visa, they should have a downloadable application along with all the rules and requirements. You can also contact the Embassy and have them mail you an application. Once you have filled out the application and collected the documentation you need, you will then have to carry your passport, application, photos and fee to one of the appropriate government offices if you live near one. If you don't have an Embassy or Consulate close to you, you will have to mail your passport with the application, fee, and photos to them. You can also use a service like FedEx. You will probably have to provide return postage as well. If you have to send your passport off, do so in the most secure way possible. Each country has it's own rules and requirements, check on the web or with an official representative to get the appropriate information. Read through all the rules and follow them... then you shouldn't have a problem getting a visa. I will admit that some applications are complicated. Using our Trans-Siberian trip as an example again, the company that set up the tour for us sent us explicit directions... step by step... for how to fill out the application. There's a headline I seem to use a lot! ...Allow plenty of time. If you live in or near a city with a Consulate, you can drop off your passport and application yourself and pick it up... sometimes later the same day.... sometimes later in the week. Some Consulates will mail your passport back to you, some won't. If you have to use the mail or an express delivery service it will take longer. Requirements may change from time to time, so even if you think you know what the requirements are because you checked years ago.... check again. You don't want to ruin a trip because you didn't get the visa! Requirements may change from time to time, so even if you think you know what the requirements are because you checked years ago.... check again. You don't want to ruin a trip because you didn't get the visa!